It has become an acknowledged fact of popular music history that the soul music of the '50s and '60s was largely a secularised version of the vocal styles of the "hard" gospel quartets that tirelessly travelled the Gospel Highway in post-war America. What is less understood is that the earlier form of vocal group gospel, which had developed in the '20s and '30s and with its cool, languid acapella harmonies and reliance on the vast reservoir of old slavery days spirituals became known as "jubilee", was also secularised. The hitmaking doowop groups of the '50s like Orioles, the Flamingos, the Moonglows and hundreds more had a singing style directly descended from the pre-war jubilee harmonizers like the Golden Gate Quartet, the Norfolk Quartet and the Heavenly Gospel Singers. Just as important as their role as stylistic pioneers, the Heavenly Gospel Singers were also the first recording act to record the song often identified as the first "modern gospel song", Thomas A Dorsey's "Precious Lord, Take My Hand". 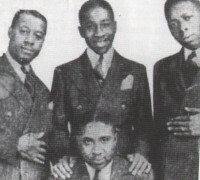 In view of their history then it is peculiar how this quartet, who recorded prolifically and who for years were second in popularity only to the Golden Gate Jubilee Quartet, have been so ignored by gospel music historians. There is only one mention of the Heavenly Gospel Singers in Horace Clarence Boyer's The Golden Age Of Gospel (and that an aside in an essay on the Dixie Hummingbirds, identifying that the Birds' great bass singer Willie Bobo had begun with the Singers) while Bil Carpenter's Uncloudy Days: The Gospel Music Encyclopedia doesn't mention them at all (though the author, bizarrely, does find room for Buddhist Tina Turner, Southern gospel's The Happy Goodmans and CCM's Kathy Troccoli). The honourable exception to this neglect are the CDs released by Scotland's vintage blues, jazz and gospel specialist Document Records whose four volumes 'Heavenly Gospel Singers: Complete Recorded Works In Chronological Order' along with 'The Heavenly Gospel Singers' compilation on Nugrape Records offer post-war gospel enthusiasts a feast of recorded material dubbed from the original Bluebird 78s made by the group. During the first three decades of the 20th century huge numbers of black Americans migrated to the Northern cities in search of work. And so it came to pass that a quartet, originally from Spartanburg, South Carolina, found themselves in Detroit. In the '20s tenor singer Fred Whitmore recruited some friends and as the Masonic Glee Club they were soon performing after work and occasionally getting engagements further afield like Chicago. Changing their name to the Heavenly Gospel Singers they were getting more and more bookings in churches and social gatherings. In Chicago Fred Whitmore met a well known singer, Thelma Byrd, who was later to marry Fred and who joined the group. Back in the Southern States, outside Murfreesboro, Tennessee, disaster struck. The group were involved in a road accident that resulted in the death of a local white judge. The whole group were thrown into prison, where they remained for a month before being released. By the early '30s only Fred Whitmore remained of the original lineup. The new members were lead singer Roosevelt Fennoy, from a town renowned for its gospel talent, Bessemer, Alabama; Henderson Massey from Spartanburg who, as well as singing baritone acted as the group's manager; and Jimmy Bryant whose growling bass earned him the nickname "Gospel Jimmy" Bryant and who was to be an influence for the secular doowop singers that followed the Heavenlies. In 1935 with jubilee singing firmly established in popularity the Heavenly Gospel Singers were signed to Bluebird, the subsidiary of Victor Records, by talent scout and record producer Eli Oberstein. On 7th August the group recorded 10 sides in Atlanta, Georgia, in a gruelling one day session, including well known spirituals like "Didn't It Rain" and "Lead Me To The Rock". Five 78s were duly released and more 10-song sessions were arranged by Bluebird, these in Charlotte, North Carolina, in February and June 1936. Wrote gospel historian Keith Briggs, "[The group] made an immediate impression on the record buying public with their innovative style which fused the elements made popular by the many jubilee groups who had already recorded with a newer, deceptively looser sounding, more involved approach to their lyrics. The first traces of the post-war gospel quartet sound could be heard in their music." The sales of their stream of releases prompted bookings which prompted further sales. With personal appearances, records and radio work the group were on a roll until their founder and tenor singer Fred Whitmore died suddenly. After much deliberation Fred's replacement was announced as Arthur Lee "Bob" Beatty. As it turned out their next 10-song session, in Charlotte on 16th February 1937, was possibly their most significant. For it was at that session that the Heavenlies were the first act to record a song which is today considered one of the most significant in the whole development of gospel music, Thomas A Dorsey's "Precious Lord, Take My Hand". Dorsey, born in Villa Rica, Georgia in 1899, was a singer, pianist and composer who, though the son of a Baptist preacher, had seemed to have turned his back on his Christian heritage. He became a blues pianist called Barrelhouse Tommy and later Georgia Tom. He moved to Chicago, formed his own group the Wildcats Jazz Band, played with classic blues legend Ma Rainey and had a huge duet hit when Georgia Tom & Tampa Red sang "It's Tight Like That", a salacious double-entendre blues song. But in 1928 Dorsey suffered a nervous breakdown and momentarily retired from music until, during his convalescence, a Baptist minister convinced Dorsey to use his musical gifts in the service of the Lord. By 1932 Dorsey had organised a choir at Chicago's Pilgrim Baptist Church and founded the first black-run Christian music publishing house. But then tragedy struck the blues-singer-turned-gospel-composer when Dorsey's wife died in childbirth, as did the son she was carrying. Immersed in grief, his musical associate Theodore Frye urged Dorsey to "get away from home and kind of get [himself] together." So the broken Dorsey found himself sat at a piano in the function room of a beauty training college. And there he began to disconsolately doodle at the piano and found himself playing an old Anglican hymn long popular in the African American church, "Must Jesus Bear The Cross Alone". With lyrics written by Thomas Shepherd (1665-1739) and music composed in 1852 by George Nelson Allen, the hymn was one often sung in old-line Baptist churches. As he played the plaintive melody subtle musical embellishments and new words began to formulate. As academic Michael W Harris records in his book The Rise Of Gospel Blues Thomas Dorsey knew intuitively he was onto something. Said Dorsey, "I called Mr Frye. I said, 'Come on Frye! Listen to this. Come over here to this piano! I've got this tune and I'm trying to put words. . .' I played [it] for [Frye]. 'What'd you think about it?' 'It's alright, sounds good.' I went over it again. He said, 'No, man, no. Call him "precious Lord". Don't call him "blessed Lord", call him "precious Lord".' 'Why, why? He IS a blessing.' 'Call him "precious Lord.' And then something hit me and went right over me, see. I said, "That does sound better! That's it." And that hooked right in here. The words dropped just like drops of water. . .from the crevice of a rock. [I sat] right there and I wrote out half of the song. . .part of the song right then and there. I finished the other in the next day or two." "Precious Lord, Take My Hand" caused an immediate sensation at the Gospel Choirs And Choruses, an annual convention where Dorsey and singer Sallie Martin would promote the latest Dorsey compositions. And so the Heavenly Gospel Singers, who were already breaking new ground in inserting new songs into their repertoire of old spirituals and hymns, recorded "Precious Lord, Take My Hand" in February 1937. It sold very well and was also reissued on the main Victor label. The Heavenlies' rendition was unusual with an interpretation Keith Briggs described as "strangely formal for them involving a complicated 'chiming' chorus." Another key recording at the same session as "Precious Lord" was "Heavenly Gospel Train". It was released on the 78 as the reverse to Dorsey's hit and gospel authority Anthony Heilbut has called it "their classic". In his book The Gospel Sound Heilbut wrote, "The quartet favoured hypnotic vamps which, by intensifying the background parts, hastened the arrival of truly hard leads like [the Dixie Hummingbirds'] Ira Tucker." Further 10-song recording session took place in August 1937 and January 1938. In many ways, the "star" of the Heavenly Gospel Singers was not their lead singer Roosevelt Fennoy but their remarkable bass singer Jimmy Bryant. Keith Briggs has written, "For some inexplicable reason [Bryant's] fame has been largely relegated to a footnote by most chroniclers of gospel history. He had joined the group straight from high school when they were still located in Detroit and had grown into a fine looking man who had the sort of effect on the sisters that would see its apogee with the adoration offered Sam Cooke in the 1950s. He is often credited with introducing the play of 'upsetting the house' by leaving the stage and roaming the audience as he sang, doubtless 'sending' its female members as he went." In 1938 Bryant was arguing continually with Roosevelt Fennoy and left the Heavenlies. He moved through a couple of other quartets before Jimmy enjoyed a brief spell with a newly formed quartet who were to become a seminal force in the new hard quartet sound, the Dixie Hummingbirds. Later still Jimmy Bryant became a member of the Detroiters, a group who'd started off as the Evangelist Singers and whose recordings for Specialty Records showed that the growling bass of Bryant was still a thing to marvel at in the '50s. Bryant's replacement in the Heavenly Gospel Singers was, as it turned out, another great bass singer who was to find fame, William Bobo. The Spartanburg native Bobo was to stay with the group into the 1940s contributing to the 10-song session they did in Rock Hill, South Carolina in February 1939; the six songs the Heavenlies recorded in New York in June 1940; the 12 songs recorded (four released, eight unissued) in New York in February 1941; and the group's final session for Bluebird, eight songs recorded at the Kimball Hotel, Atlanta, Georgia in October 1941. With the Second World War underway things began to draw to a close for the Heavenly Gospel Singers. Baritone Henderson Massey and tenor Bob Beatty were drafted into the armed forces. As Keith Briggs has written, "Their replacements Tom Woodruff and Robert Hardy were worthy enough but the glory days of the group were gone. For awhile they limped on relying once again on their 'home' territory of the coal fields in Virginia and the Carolinas as the main market for their live performances." As personnel in the Heavenly Gospel Singers came and went the group's name became the property of Henderson Massey. Bobo had left to find fame and fortune with the Dixie Hummingbirds (singing bass with them until his death in 1974) and briefly the group's previous bassman Jimmy Bryant, having left the Detroiters, was cajoled back to join a revamped version of the Heavenly Gospel Singers. But that attempt to resurrect the group's fortunes failed and Bryant, almost inevitably in view of his bass voice credentials, joined a secular doowop group, The Ebonaires. Bryant, one of the great bass voices of gospel, finally died in Toronto, Canada. With a revolving door personnel the Heavenly Gospel Singers slowly spluttered to a stop. A group using the name did record eight sides for Manor Records in the mid and late 1940s but they were from Alabama, recorded later as the Stars Of Harmony and the Lincoln Gospel Singers and had no connection with the pre-war group. Thanks to the fine Document Records CDs the loose and languid harmonies of the Heavenly Gospel Singers are still available to be heard by the new generation of gospel fans. Tony Heilbut wrote about the group, "Their repertoire included newer tunes and they stand on the verge of gospel quartet while still featuring the sustained notes and blocked chords that characterise early quartets - in a word, harmony over expression." And Keith Briggs has the final word about the Heavenly Gospel Singers, "They were the precursors, the pathfinders of 'The Golden Age'." You mention H. Boyer and Carpenter as not having much about the Heavenly Gospel Singers, but you don't mention Great God A'Mighty! The Dixie Hummingbirds wherein I talk about them quite a bit, especially in relation to the career of the 'Birds. Mr Cummings, thanks so much for the work you are doing in the music industry. Roosevelt Fennoy is my father, I have four other brothers ans two sisters. Dad died when we were all very young, any more information you may have on the Heavenly Gospel would be greatly appreciated. May the Lord continue to bless the work you are doing.